"Meow there! My name is Little Ramona, but I have a great big personality! I'm what's known in Felineality circles as a Leader of the Band -- a bold, confident cat who loves people and adventure." "I'm a very pretty brown and black tabby kitty with super soft fur. I was transferred to Wayside from another shelter that was out of space. When I came to Wayside, I was in pretty bad shape. I had a terrible upper respiratory infection, which, thankfully, is now cured. Also, my left front leg was severely atrophied and was hurting me. I must have badly injured it at some point. The vets here at Wayside decided it would be best to amputate it. So now I'm a three-legged kitty. It hasn't gotten me down at all. In fact, I still love to play with toys, even with just one front paw. People here at Wayside say I'm playful, affectionate, and a "real sweetheart." I've also been told I have an indomitable spirit. If you're looking for a sweet, beautiful friend who'll help you keep your sunny side up even when life gives you rain clouds, come to Wayside and meet me, Little Ramona! Some people might think our little girl here is less adoptable because she's a tripod kitty, but we think that's rubbish. Differently-abled kitties like our girl here are very special, and we're looking for someone equally special to adopt her. Are you the one? She's waiting at Allie's Alma Mater, Wayside Waifs. Thanks to you, A Tonk's Tail is up for the Petties' Funniest Blog Award! Winning would mean $1,000 for the cats of Great Plains SPCA. Their numbers are creeping up to 800 - and they are running out of supplies. 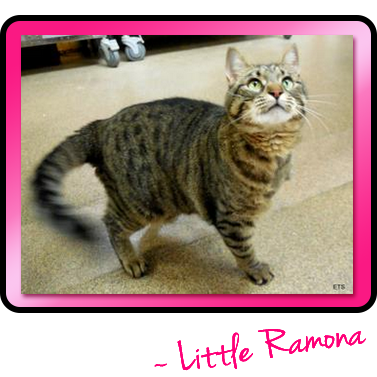 Ramona, you sound like a totally AWESOME kitty! Differently-abled kitties are pawesome! Cousin Earl is also missing one front leg, but he can do everything a regular cat can, even steal treats from his brother with his one front paw. Ramona is going to make a family very happy! You little sweetie! Hope you find the right furrever home soon! Aww... sweet Ramona. We hope you find a loving forever home very soon!